Regular exercise is the key to a healthy lifestyle and walking is one of the best ways to keep fit. 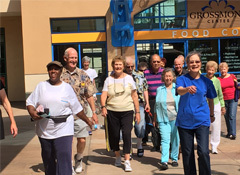 Join the Grossmont Mall Walkers, a free fitness program for adults sponsored by the Sharp Grossmont Senior Resource Center in cooperation with Grossmont Center. Malls are some of the best places to walk, because they're convenient, pedestrian-friendly and accessible to people of all fitness levels. Group members are free to walk during the days and times that are most convenient for them. You can also take advantage of special programs and planned social events throughout the year. Every Saturday, the program offers free exercise classes at 8 and 9 am inside the Grossmont Center Food Court. An instructor will lead you through gentle exercises that can improve your balance and increase your strength. Advance registration is not required and you don't need to be a part of Sharp HealthCare to participate. If you have a question, please contact the Sharp Grossmont Senior Resource Center at 619-740-4214 or provide your name and email address in the "Learn More" box. Someone will contact you within two business days.